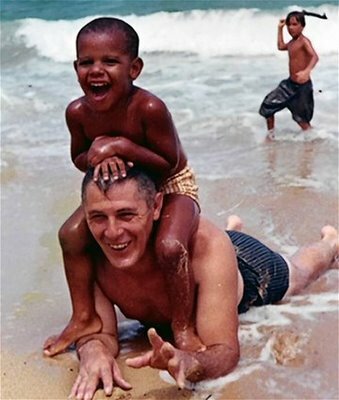 Barack Obama at about four years old with his Grandfather Stanley Dunham in Hawaii in approximately 1966. This photo was probably taken before Obama moved to Indonesia to live with his mother Stanley Ann Dunham and her second husband Lolo Soetoro. current 15:24, 5 July 2009 339 × 400 (30 KB) Pickens (Talk | contribs) Barack Obama at about four years old with his Grandfather Stanley Dunham in Hawaii in approximately 1966. This photo was probably taken before Obama moved to Indonesia to live with his mother Stanley Ann Dunham and her second husband Lolo Soetoro. This page was last modified on 5 July 2009, at 15:24.